Previous dating of bone fossils found at Neanderthal sites in the region put the youngest at about 35,000 years. But researchers from Australia and Europe re-examined the bones using an improved method to filter out contamination and concluded that the remains are about 50,000 years old. If true, the study, casts doubt on the idea that modern humans and Neanderthals co-existed—and possibly even interbred—for millennia, because humans aren't believed to have settled in the region until 42,000 years ago. 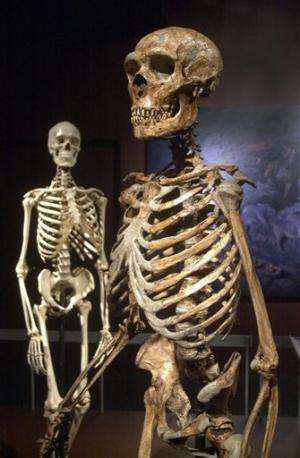 "The results of our study suggest that there are major problems with the dating of the last Neanderthals in modern-day Spain," said Thomas Higham, deputy director of the Radiocarbon Accelerator Unit at Oxford University in England. "It is unlikely that Neanderthals survived any later in this area than they did elsewhere in mainland Europe." The study, which was published Monday by the journal Proceedings of the National Academy of Sciences, doesn't completely exclude the possibility that Neanderthals survived until 35,000 years ago. The problem is that the warm climate on the Iberian peninsula quickly degrades a key protein used in so-called radiocarbon dating. The researchers were only able to test bones from two of the 11 known Neanderthal sites in Spain. They were subjected to a new method called "ultrafiltration." This removes more recent carbon molecules that have contaminated the bones and made them appear younger than they actually are. Such techniques often lead to older radiocarbon dates, said, Chris Stringer, a senior research fellow at Britain's Natural History Museum. "Science moves on and technology moves on," he said. Stringer, who was not involved in the study, said the new techniques should now be applied to other sites in Spain. "Until this is done, there must be a significant question mark over the possible late survival of Neanderthals in the region." If the remains from the other sites, too, turn out to be older, any encounter between Neanderthals and humans would have to have taken place earlier than previously thought, he said. "Evidence from Britain, Belgium, France, Germany and Italy is increasingly pointing to a modern human presence before 40,000 years ago," said Stringer. "The new chronology suggests that any interaction between the last Neanderthals and the earliest moderns in Europe will similarly move before, rather than after, 40,000 years." There is also the chance that Neanderthals survived longer in other corners of Europe, said Rachel E. Wood of the Australian National University in Canberra, a co-author of the study. "There are some other possible areas that may have also acted as a refuge for the species, such as the Caucasus, but the 'young' radiocarbon dates in these areas have also found to be problematic," she said. Don't believe Neanderthals are extinct. Seen plenty in my time, in fact I'm married to one. They do have larger brains and are very good engineers which means they are good at fixing things that go wrong. Not bothered by the hairy tummy. Neanderthals were probably the natural evolutionary next hominid on this world had not interference from elsewhere, notably the Nibiruans and the "sons of the gods", altered forever the natural evolution of humankind on Earth. Earthlings had, and continue to have, much greater intellectual potential than that of the visitors, but that fits well with the model wherein the earliest intelligent beings invariably find themselves more primitive than more recently developed intellects on the cosmic scale. We should therefore probably someday be presented with the opportunity to maintain some respect for emerging alien humanoids, given that we're going out there, like it or not. Uh right. Neanderthals were a temperate species ie their reproduction had most likely become seasonal, like most any temperate animal. They had mating seasons. As such they could not replace battle losses as quickly as the tropical cro mags and so were overrun and extincted. We need no superbeings to explain the oversized human brain. Once humans became able to hunt those creatures that had kept their numbers in check, overpopulation and the resultant conflict among tribes over resources made tribalism the main mechanism of human adaptation. Tribes whose members were better able to cooperate, plan, organize, communicate, and weaponize were more likely to prevail in conflict, kill opposing males, and incorporate captured females; and so were quickly selected for. if ultrafiltration re-dates neanderthal sites to be older than previously believed, won't it also do the same for cro-magnon sites? so wouldn't that make jumping to the conclusion that the two probably did not coexist/interbreed a bit premature? Theories about when the last Neanderthals walked the Earth may have to be revised, according to a study that suggests they became extinct in their last refuge in Spain much earlier than previously thought. " Theories are always being revised. Thanks for the humorous note. Hard to believe people actually gave you a bad vote because they thought you were serious. But hey, you know nerds (my wife is married to one). Also, the oldest modern human settlements we've found evidence of are extremely unlikely to be the actual first settlements. Same as the "last" neanderthal settlements. Especially when seeking evidence of small gatherings of hominids from over 40,000 years ago. What happened to those studies describing supposed Neanderthal genes still in modern human gene pools that I was reading about a few months ago? Well there you go. Mingling asians again. Probably they were bored. Only bones from 2 of 11 sites examined. The most important (Altamira) not examined. "The problem is that the warm climate on the Iberian peninsula quickly degrades a key protein used in so-called radiocarbon dating." So their work is based on estimations. And most Neanderthal sites in Spain are in caves, meters under the surface. "Stringer, who was not involved in the study, said the new techniques should now be applied to other sites in Spain. "Until this is done, there must be a significant question mark over the possible late survival of Neanderthals in the region."" That's an incomplete study based on assumptions and should not lead to any conclusion like the title of this article. And I wonder, if Neanderthal where adapted for cold conditions, why their last refuge in Europe should be in the warmest place? Well Spain is at roughly the same latitude as new england. And 50k years ago was the last ice age yes? Since the earth is only 7,000 years old it is clear that God didn't wan't Neanderthal's to survive the flood, and gave them no space on the Arc. It is all explained here. My missus called me that and I happen to do electronic engineering. Your 2nd reference is from a creationist who quotes 1 Peter and Ephesians on his cover page. As we know, peter didnt write 1 Peter and Paul didnt write ephesians. They are both therefore forgeries. Nonsense. Neanderthals are not extinct. Just look at Chuck Norris. Archeologists and scientific researchers in that field are like weathermen. Being wrong is not going to cost you your job, and no-one is really sure about anything anyway. Still, they've got to get something out there to justify their presence. Plato thought that Atlantis lay just beyond the strait of Gibraltar, long since turned to unidentifiable ruins and mud due to some natural calamity. However, there is compelling evidence that his grandfather Solon, from whom this information comes, was very likely describing the continent of South America. That jives well with the history described by the early Sumerian scribes of the banishment of Marduk to "the land across the waters". They flew in those days, you know. It's okay to believe the wrong thing for a few thousand years where this kind of subject matter is concerned. It doesn't change anything. 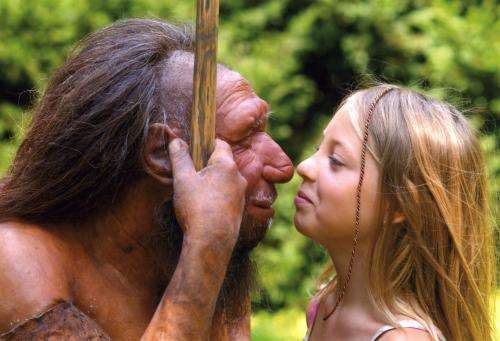 So then what about the genetics studies which say there is mixture of gens betwen neanderthals and modern humans? There were so many articles last year about modern humans interbreeding with both Neanderthals and Denisovans. I somehow doubt this new study. It just contradicts too many other studies from different fields. If it is correct, then that means that the age of modern humans also should be brought back. Which is fine by me.